Do we know the compostion of the panel for next Thursday? Who is replacing Posner? Assignments are posted the morning of the day for which the case is scheduled. fairly soon after the case is heard. Edited by Hap, 11 September 2018 - 12:03 PM. Thanks I hope to be there, although it may not be possible. I won’t be able to use a phone inside the courtroom, but I will post who was on the panel when I depart. Will they allow us to carry a phone if we turn it off? It wasn't allowed in Springfield, but I do not remember when we were in Chicago last. I just confirmed my recollection--according to the Clerk's office, we CAN have phones in the courtroom if they are on "silent." IMHO it's probably best to turn them off to be absolutely sure they don't ring. The G.W. Bush appointed Diane S. Sykes; G.H.W. Bush appointed Ilana Rovner; Ronald Reagan appointed Joel Martin Flaum, Frank H. Easterbrook, Michael Stephen Kanne, Kenneth Francis Ripple, and Daniel Anthony Manion. William Joseph Bauer was appointed by Ford. Bauer, Ripple, and Manion has senior status. The remaining judges, Diane Wood and David Hamilton, were appointed by Clinton and Obama respectively. Easterbrook is the author of the atrocious decision in Friedman v. Highland Park, to which Manion wrote a blistering dissent. The third judge in that appeal is no longer on the Court. Unlike other circuits, even if we lose there's a decent shot at en banc here. It'll all depend on Posner's replacement IMO. If IL loses, I wonder what the chances of an appeal are. Specifically, to a Court with Kavanaugh on it. I'd be willing to bet that an IL loss is not appealed. If they lose they'll certainly ask for en banc. I suspect that they won't appeal to SC. Any advice for how early to arrive Thursday? While in the past it wasn't an issue as these were very litely attended, due to the Amicus Briefs filed by the other side they may have some people there as well. 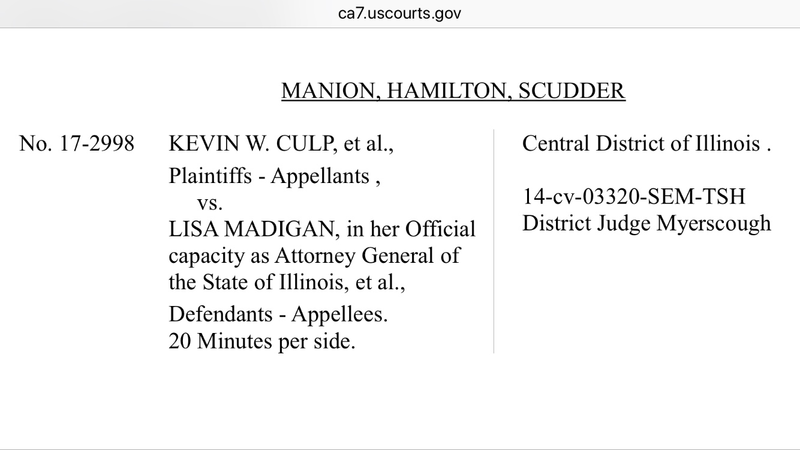 Manion, Hamilton, and Scudder are scheduled to hear oral arguments today. Hate to be the bearer of bad news but this was an absolute train wreck. Our side has fallen right into the trap of arguing all the minutiae of the various state laws, even offering annual mental health exams in order to apply. Why aren't we arguing that this is the same ban in Moore, Young, and the 19th Century cases cited in Heller, just for non-residents? It just isn't any more complicated than that, unless there's something I'm missing. And it looks like Trump has whiffed on Michael Scudder's appointment to the 7th Circuit. I have listened to the audio and the questioning was brutal but it was brutal on both sides. When questioning the attorney for the state, I felt the judges could possibly lean our way. It's hard to say, can't judge a judge by their questions. We'll see! I'm not discouraged! I don't see why anyone here is surprised. Your two left-wing senators praised his appointment as well as the appointment of St. Eve. You know, the judge who thinks gun-free zones which extend 1,000 feet from schools are constitutional. I'm hopeful this ruling will go the right way. The illogic of legally allowing me (a law abiding, lcensed and fully trained citizen that TEACHES the Illinois CCL classes) to carry a gun virtually anywhere in Illinois EXCEPT while in public outside my car should be so obviously an undue burden on my right to keep and BEAR arms, that even Federal judges would understand it to be so. The greatest risks occur when you are NOT in your car, home or fixed place of business, but out on the streets. I heard one of the judges desire for studies and research on such matters. With all due respect to Federal judges, who I presume to be highly intelligent, have they no ability to think, particularly when the State of Illinois' own regulations have no way to determine if their own residents are in continued compliance with their rules after they've received their license? I know of Illinois CCL holders (two of which were students of mine) that have used their firearm to save their life while in Indiana outside their car or fixed place of business. It would be nice if I was afforded the same consideration while spending time in Illinois, but I'm not asking for that. Simply that I may apply for and obtain an Illinois license. As it is now, I may drive to a class or work place in Illinois while carrying. I can carry while at work. I can carry when going home. I can carry when going to get gas. I just cannot carry when I get out of my car while actually punping gas, which is when I am most vulnerable. Edited by ChicagoZman, 21 September 2018 - 04:23 AM. Guess the Senate is still using the blue slips. Comes down to this, for me anyway, the state applies the right to self defense (2A) for non-citizens differently than citizens of Illinois. The fact state law prohibits any equally qualified non-resident a permit based on the laws of their state is ridiculous. It is ridiculous and I was disappointed Sigale didn't just tell the judges that it's not his client's problem that IL can't run what they deem is a proper background or monitoring check. Exactly. I've stated many times that a regulatory system that is impossible is obviously an unreasonable burden, and can't even pass rational basis as far as a government regulation. "Rational basis" doesn't mean what you may think it means. For judicial review of a law, rational basis just means the law has some reason to exist, even an unsubstantiated ideological assertion (e.g., "banning guns will eliminate crime"). It simply cannot be arbitrary or capricious (e.g., "ban guns because I don't like them"). They often tear an attorney for one side apart, then rule in that side's favor. It's the questions asked by two judges going in the same direction that is often telling. I guess I'll have to listen again but did Scudder say anything other than suggest the IL supreme should weigh in if the statute is being applied correctly? Yep, I agree with that point. Whats going on with this case? No update in a long time. Edited by vezpa, 27 January 2019 - 08:00 PM. The 7th Circuit Court of Appeals hasn’t issued a ruling yet.